Analysis of Copper and Its Alloys provides important information for the satisfactory analysis of typical industrial products. This book presents several instrumental methods for analysis, which involve the use of instruments that are familiar, even in small laboratories. 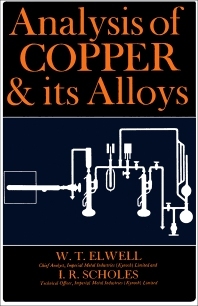 Organized into 34 chapters, this book starts with an overview of the various factors that are common to most methods of sampling copper-base materials, regardless of the quality and quantity of material to be sampled. This text then discusses the safety precautions pertaining to the handling of reagents and apparatus. Other chapters consider the factors that influence the determination when copper is electrolytically deposited in the conventional way, including the simultaneous co-deposition of other metals, the retention of copper, and the inhibiting effect of metals. This book discusses as well the presence of refractory tin oxide in tin-bearing alloys. This book is a valuable resource for chemists, teachers, students, and researchers. 33. Suppliers of Reagents, Apparatus, etc.